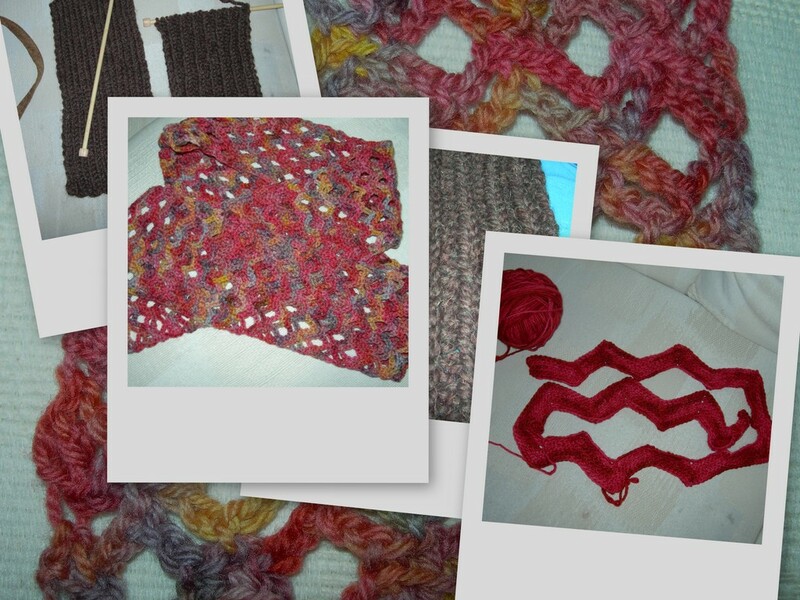 Over the last two days I have gotten quite a lot done on some knitting and crochet projects. I have not yet once touched the Big Secret Project. I guess I’m feeling selfish. The brown items are legwarmers — I have to purchase another skein of yarn to finish the second one, but the first one is done and just needs to be sewed up. I’m using Lion Wool-Ease Thick & Quick in Wood and a pattern from Midnight Knitter called Aspen Leg Warmers. The fact that this is my first knitting project did not stop me from adjusting the pattern. I tried to do all the math to figure out the gauge, and it seemed like the guage with the yarn I’m using was different enough from the guage in the pattern that I should size the legwarmers I’m making down a bit. So, I cast on 23 instead of 28. They are very stretchy, which is the only reason that I didn’t have to tear out the first one and start over, casting on more stitches. I think I should have cast on 25. But, whatever. It’s a very easy rib pattern. She’s got a lot of other cool free patterns posted as well, in knit and crochet. The red stuff is a scarf/wrap that I’m making with the Malabrigo I bought for myself. (Sorry, I don’t feel like tracking back to that old post. Blame my cold.) I’ modifying the Zigzag Scarf pattern in Hip to Crochet (which I got as a Christmas gift, along with a subscription to Crochet! from my Aunt & Uncle). I’m making the scarf 100 stitches shorter than the pattern calls for — it was just way too long, so I took it back. This yarn is so soft and lovely to work with, I can’t wait to finish this project and wear it. Next up on tap is a new knitting project that I have thrown into the mix — a scarf for Kristen D., which I’ll make with Debbie Bliss Cashmerino Aran. I randomly bought a ball of it last time I was at Windsor Button. I picked it up because I was aftraid that the Zen Scarf was going to work up way too short. I’m not sure what I was going to do if that was the case, probably add gigantic tassels, or undo the thing halfway and put a Cashmerino middle into it. Anyway, I’m hoping to find a cute scarf pattern made with that yarn to work up for her. Speaking of the Zen Scarf, I finished that up while I was home for Christmas. It’s lovely and soft and beautiful . . . and it was so easy! !